YONGIN, South Korea, April 16, 2018 /PRNewswire/ — GC Pharma (formerly known as Green Cross Corporation), a South Korean biopharmaceutical company, joins World Haemophilia Day; observed annually by the World Federation of Haemophilia (WFH) and the global haemophilia community to raise awareness of the disease and other bleeding disorders. This year’s theme is "Sharing Knowledge Makes Us Stronger". With this theme, the global bleeding disorders community focuses on the importance of sharing knowledge. 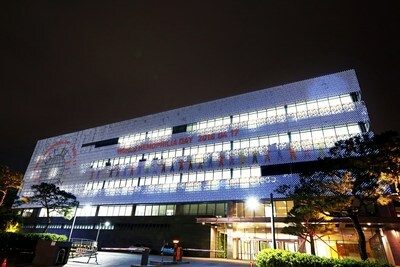 As part of GC Pharma’s continued support of the haemophilia community, the company features this year’s theme image on its global website and giant exterior façade of its main campus in Yongin, South Korea. "GC Pharma is proud to support the global haemophilia community in honouring World Haemophilia Day," said EC Huh, Ph. D., president of GC Pharma. "We recognize the need for continued education and awareness as we move ahead for making a difference in the lives of people with bleeding disorders." World Haemophilia Day (WHD) occurs each year on 17 April. Since its creation in 1989, WHD has served as an opportunity to increase awareness of haemophilia and other bleeding disorders. Haemophilia is a congenital disorder that causes longer-than-normal bleeding due to absent or deficient clotting factor in the blood. Haemophilia A is more common than haemophilia B; haemophilia A affects about 150,000 people, whereas haemophilia B affects about 30,000 people worldwide. Treatment regimens typically include on-demand and/or regular prophylactic infusions of factor replacement therapy to control or prevent the risk of bleeding. People with haemophilia, working closely with their healthcare professionals, can live healthy lives with proper care and adequate treatment. GC Pharma (formerly known as Green Cross Corporation) is a biopharmaceutical company that delivers life-saving and life-sustaining protein therapeutics and vaccines. Headquartered in South Korea, GC Pharma is the largest plasma protein product manufacturer in Asia and has been dedicated to quality healthcare solutions for more than half a century. Green Cross Corporation updated its corporate brand to GC Pharma in early 2018. Green Cross Corporation remains the company’s registered, legal name.